(Synopsis) U.S. Air Force fighter pilot Noah Miller—call sign Burn—loves nothing more than flying hard and fast. When he meets a gorgeous and sassy woman while partying in Las Vegas, he immediately locks on to her. Chanel Cleeton is making every girl's Top Gun fantasies come to life in her Wild Aces series. No matter how many times main character Noah Miller tells Jordan that Top Gun was Navy and he's Air Force, it doesn't matter. 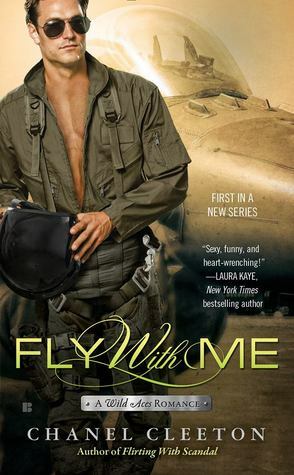 While reading Fly With Me, I had images of Maverick engaging bad guys in his fighter plane and making love in the sunset. Not that Fly With Me isn't hot enough on its own. It totally is. Noah and Jordan have incredible chemistry right from the beginning. On top of that, both MCs are so likable. Noah is truly an honorable, good man. Once he commits to Jordan, he's in it for the long haul, and he's always honest with her. Jordan is a strong woman who bravely takes a chance on love and follows her heart, even when it's the tougher road. Noah and Jordan meet in Vegas, make an incredible connection, and decide to do the long distance thing. I've been there - it's hard. Fly With Me was so much more emotional than I thought it would be. The long distance relationship and how challenging it was for both of them made my heart hurt. The military life seems extra hard given the danger and the moving around. Chanel Cleeton is such a great writer. I felt everything Noah and Jordan felt. It brought tears to my eyes. I really loved Fly With Me. As soon as I was done, I moved on to book 2 because I couldn't wait to find out what happened to other members of Noah's inner circle of friends. And because every girl could use even more Top Gun fantasy fodder.